The Radio and Television program is a transfer program approved ICCB and the Illinois Board of Higher Education. Through theoretical and practical “hands-on” courses, the program prepares students for a successful transfer to a four-year institution. 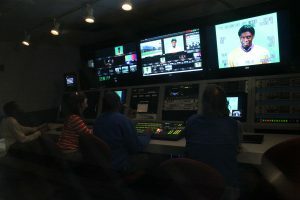 The program features a digital audio production control room and studio, a state-of-the art television control room with multi-camera video switching, a television production studio with grid lighting and a multimedia lab with 20 non-linear Avid Media Composer editing computer stations enhanced with additional software like Photoshop, Audacity and Pro-Tools. The mission of the Radio & Television production program is to prepare students for transfer to a four-year institution by providing an academic foundation through theoretical courses and practical “hands-on” courses featuring current technologies with a major focus on audio and television production, directing, editing and writing skills. Courses emphasize the ability of students to critically think and write about course subject matter and then express their thoughts through written and oral communication and/or performance using technology. The learning objectives of the program are designed to empower the student to understand and create media productions, enhancing the knowledge of the student in preparation for educational advancement. Write topical papers essay with proficient structure, content and mechanics. Use critical thinking skills to articulate content via written and oral communication. Perform proper historical and cultural research to be used as evidence to support class content. Demonstrate proficient knowledge of audio and video terminology and applications. Demonstrate proficient production skills on video and audio production equipment. Demonstrate proficient knowledge of basic computer/TV graphics. Demonstrate proficient non-linear editing skills on digital/computer stations utilizing its software to manipulate video, audio, graphics and other images. Demonstrate proficient directing, scriptwriting and producing skills. This is only a suggested transfer program and might not be appropriate for every student. Some four-year institutions accept more than 62 credits in transfer to fulfill requirements in communications. Consult the Transfer Center for help in selecting courses appropriate for the program at the college or university where you plan to transfer. Faculty are available during scheduled office hours to advise students about their courses and programs. Peruse some of the offerings in the Department of Communication and Humanities.